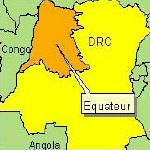 A major international donor conference for the Democratic Republic of Congo is being held in Paris. 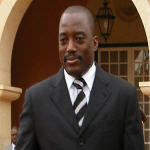 It is the first opportunity for the international community to pledge aid for the country since 2006 polls that confirmed Joseph Kabila as president. Authorities in the northwestern Democratic Republic of Congo (DRC) province of Equateur have imposed a nighttime curfew in the area until further notice in a bid to curb insecurity, including murder and extortion by armed men. 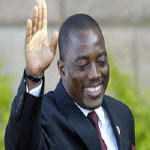 The president of the Democratic Republic of Congo has announced changes in his government, naming 10 new ministers, while at the same time reducing the number of government positions. 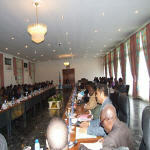 Kari Barber reports from Kinshasa those in opposition to the government say it needs more than a reorganization. In the Democratic Republic of Congo, the National Congress for the People's Defense rebel group has categorically denied that its leader, General Laurent Nkunda is dead. 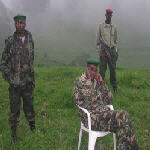 The rebels say the speculation is a calculated attempt by President Joseph Kabila's government to undermine the group's unity of purpose, which they say is to protect the Tutsi minority in the country. 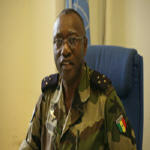 They also criticized the United Nations military force (MONUC) of backing government forces against the rebels. President Joseph Kabila announced the names of ministers in the new Cabinet chaired by Prime Minister Antoine Gizenga today. Most key ministers of the previous cabinet retained their positions. 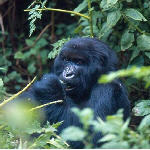 WWF and Congolese authorities are celebrating the ten millionth tree planted around Virunga National Park in the eastern Democratic Republic of Congo (DRC), a crucial habitat for the endangered mountain gorilla. 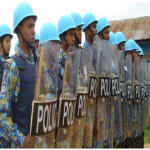 Aiming to reduce traffic accidents and foster respect for the rules of the road, the United Nations peacekeeping mission in the Democratic Republic of the Congo (MONUC) has completed training of nearly 50 police officers in Ituri province. The head of the army in the Democratic Republic of Congo says he has given up all hope of a peaceful solution to the conflict in eastern Congo. A United Nations military official says U.N. peacekeepers will help the Democratic Republic of Congo's army disarm eastern rebels by force. In comments broadcast on local U.N. radio Thursday, General Babacar Gaye said all peaceful means to make the rebels lay down their weapons have been used up. It may only be a short walk from its bustling neighbour Sake, but Kimoka is a ghost town. Homes are abandoned, the school is deserted and the brand new church empty. Light streams in through the open door onto huge leather drums beside the pulpit. When the congregation fled, the drums became redundant. 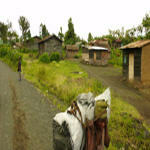 Now the only percussion comes from the small arms fire echoing through the mountains.